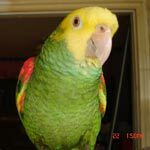 Parrot Forum • View topic - Do mated parrots have aggressive fights? Do mated parrots have aggressive fights? Hi. Im just curious. People keep their parrots in seperate cages, to protect them from fights. But have there ever been accounts of bonded parrots thst live together, in same gage, having a fight? One in where one gets badly hurt???? A beak bit off or a toe bit off? Re: Do mated parrots have aggressive fights? Yes, mates have been known to even kill their mates but it's ALWAYS because the conditions are bad - inadequate housing, bad diet, sexual frustration from human light schedule, etc. It never happens in the wild, only in captivity and only when the people keeping them don't know what they are doing. Basically, it's always the owner's fault. We have had to separate pairs, although I don't really know if they were bonded to begin with. I suspect they just don't have enough space. I took in a mated pair of cockatiels from the same place I got Rainbow. They had been together for many years but Curly turned into a wife abuser. Poor Sunny took the position of a battered wife. She had feathers ripped out and was very depressed but kept trying to be with him. He was so mean to her that I tried to separate them. She cried and called for him all the time. I rehomed him and she seemed to calm down. When he was given back to me she started her calling again. I rehomed her to a woman with two male cockatiels. One fell in love with her on first sight. She responded to his attention.